Revenue totalled $4.95 billion compared to the $4.25 billion recorded for the same period of the prior financial year; this represents a 16.47% increase year over year. Cost of Sales increased by 8.81% from $3.19 billion to $3.47 billion resulting in Gross Profits increasing by 39.57% to close at $1.48billion (2017: $1.06 billion). Finance and Other Operating Income totalled $126.36 million relative to $182.77 million in 2017, a 30.86% decrease year over year. 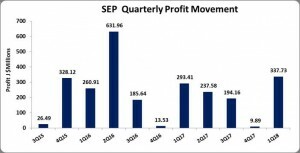 As such Operating Profit grew 17.64%, moving from $456.57 million for the first quarter of 2017 to a total of $537.12 million for comparable period in 2018. Finance Costs totalled $139.10 million (2017: $69.85 million); a increase of 99.14% year over year. Share of Results of Joint Venture recorded a gain of $2.93 million compared to a loss of $17.75 million; this led to Profit before taxation increasing to $400.95 million in comparison to $368.97 million reported last year. The company reported Net Profit of $292.90 million, a growth of 3.51% relative to last year’s corresponding period of $282.96 million, following taxation of $108.05million (2017: $86.01million). Net Profits attributable to shareholders amounted to $337.73 million, an improvement year on year from the $293.41 million recorded a year earlier. Total comprehensive income attributed to shareholders amounted to $351.73 million versus $297.24 million recorded for the first three months of 2017. Earnings per share for the quarter totalled $0.65 (2017: $0.57). The twelve months trailing EPS is $1.51. The number of shares used in this calculation was 516,397,918 shares. As at May 15, SEP stock was trading at $36. As at March 31, 2018, the company’s total assets increased by 9.52% to $19.33 billion from $17.65 billion a year ago. The increase in assets was largely due an improvement in inventory which increased by $705.72 million to total $2.88 billion (2017: $2.17 billion). Shareholder equity for the period was $9.32billion relative to $9.26 billion last year a 0.58% increase. This resulted in a book value per share of $18.04 relative to $17.94 as at March 31, 2017.